Though by the 1980s, we got the pattern, in 1968, Frank Zappa had to be the most unpredictable artist working. That year saw the release of three albums. First was the most straightforward of the releases — We’re Only In It For the Money, an album where this is the only context in which it can be called “straightforward.” Next was the musique concrete avant-garde classical LP, Lumpy Gravy. So, what better way to follow your first foray into the world of “serious” music? By recording an album in one of the least “serious” genres, Doo-Wop: Cruising With Ruben & the Jets. Though there’s been a minor critical reappraisal in the years since, in the ’60s, Doo-Wop wasn’t regarded particularly well. Sha-Na-Na, the Doo-Wop revival act, wouldn’t be formed for another year. Much of it was just written off as sentimental, vapid fluff. (Given, too, that Doo-Wop was a primarily Black genre, there’s likely a racial element in the writing off of the genre; same with Disco.) But if there are two genres Frank Zappa was drawn to, it was modern classical and the R&B of his youth — and classical was covered with Lumpy Gravy. The original back cover of the album, complete with the story of Ruben Sano. Cruising With Ruben & the Jets isn’t a 100% faithful rendition of the genre. In The Real Frank Zappa Book, Zappa refers to changing up the chord structures and quoting Stravinsky on the album. But while he’s definitely having fun with the genre, it’s surprisingly reverent. While the lyrics for most of the songs are brightly empty — or, alternately, filled with the deepest of teen angst — they’re performed straight. If someone wasn’t paying attention, listeners could easily mistake Cruising With Ruben & the Jets songs for the real thing. There are, of course, a few hints that the album isn’t actually a lost classic from the ’50s. Four tracks, “How Could I Be Such a Fool?,” “I’m Not Satisfied,” “You Didn’t Try to Call Me” and “Any Way the Wind Blows” previously appeared on Freak Out!. 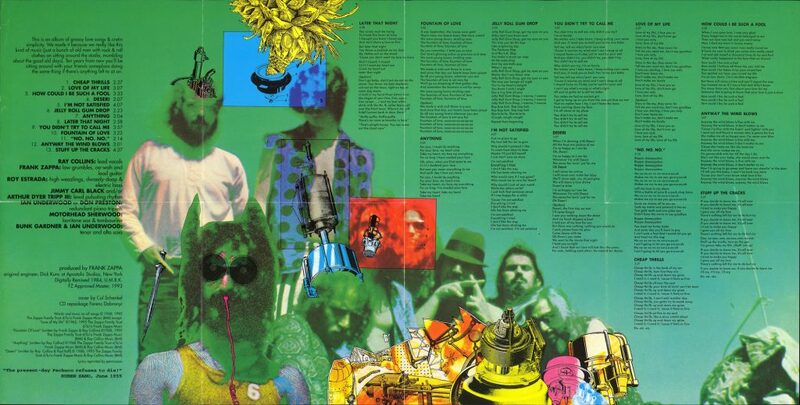 The album art looks like a Frank Zappa record, even before you read the word balloon asking if the album is “a last ditch attempt” to get the Mothers of Invention on the radio. 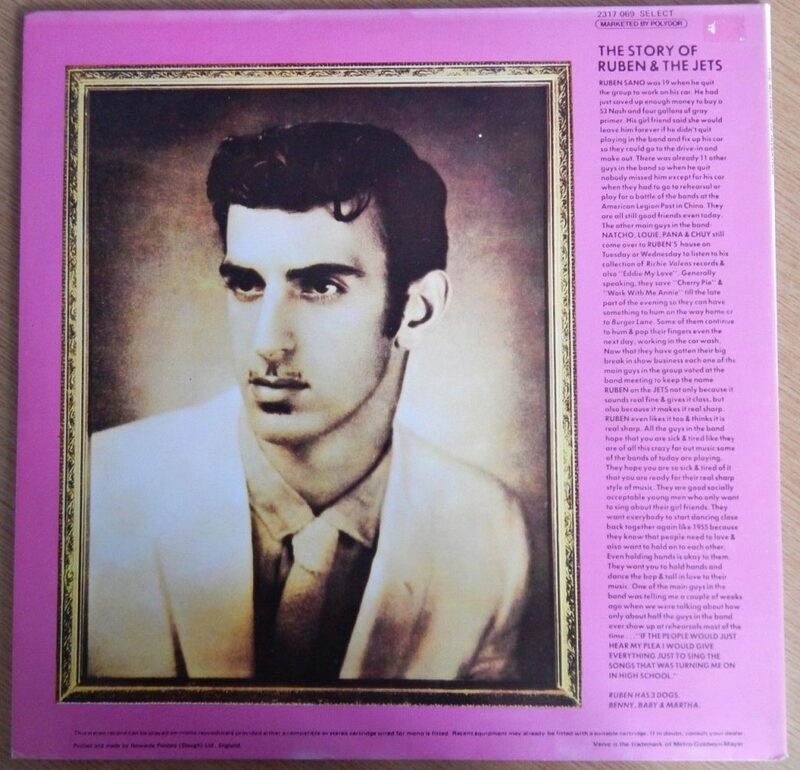 Still, apparently some people were fooled — on the Greasy Love Songs collection, Zappa even tells of some radio programmers who put Cruising With Ruben & the Jets into rotation until they realized it was the Mothers… and got mad at Zappa for “fooling” them. The gatefold design — totally looks like a legit Doo-Wop album, no? Totally not a Zappa album, even though it says his name right there. This is legitimately one of my favorite Frank Zappa albums. I like Doo-Wop generally speaking, and it’s still the early part of Zappa’s career where even when he’s goofing on a genre, there’s a sincerity there. It’s clear that Zappa loves this stuff; he kids with love, which is rare for him. Many times, Zappa approaches the subject of his satire as an outsider, removed from it. But on Cruising With Ruben & the Jets, he’s revelling in it, and it makes the album a joy. This is, like We’re Only In It For the Money, a victim of Zappa’s ’80s remixing. The ’80s remix, currently available as the default version of the album, isn’t nearly as awful as the Money mix (let alone the Lumpy Gravy mix which was too bad to even release), but the redubbed drums and bass do not fit in stylistically at all. The remix is full of slap bass, sounding like Les Claypool was wandering by as a Doo-Wop band plays in some sort of Back to the Future/Marvin Berry-type situation. Thankfully, the original vinyl mix was eventually released as Greasy Love Songs, along with bonus tracks — this is the version to get. It’s one of Zappa’s best albums as it was meant to be heard. By the way — this should not be confused with Ruben & the Jets, the real band. They were discovered by Zappa who gave his blessing to their name and produced their first album, For Real!. Motorhead Sherwood was, oddly enough, a member of both the Mothers lineup that recorded Cruising With Ruben & the Jets as well as this Ruben & the Jets. The real band only recorded one other album, Con Safos, before breaking up.